The Outlaw Gardener: Time for some Winter Magic! 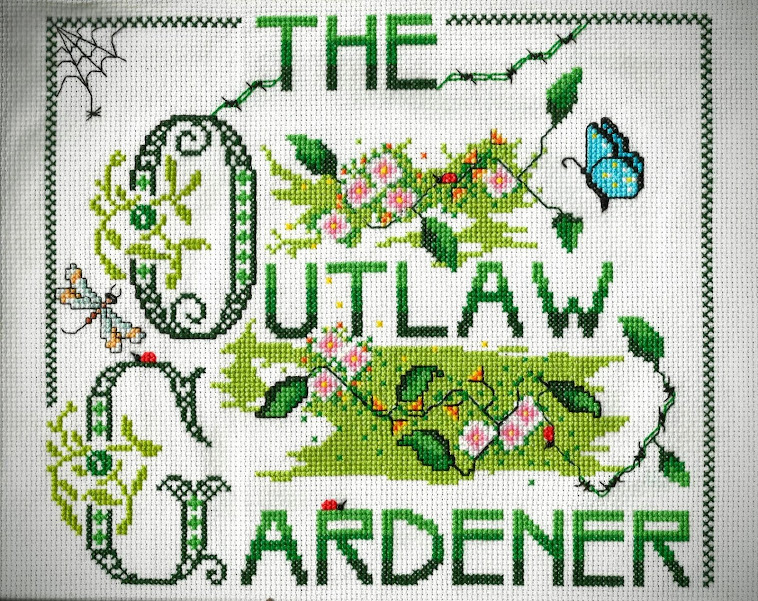 You may recall my posts about Judi Hook's garden full of her own unique artwork here. Recently, we had the opportunity to once again visit her garden, enjoy her previous work and see some new pieces that knocked my socks off! There is certainly no lack of color n this winter garden! You may recall Judi's "Seed Pods" from my previous post. She's taken the idea to new heights and designed cool stands for her pods as well! The exciting news is that Judi has decided to produce work to sell! If you are interested her work, please call her at (253) 847 - 2937 as she loves to discuss her process. Alpine Nursery, website here my previous visit here, exclusively carries Judi's work. Soon I'll post about my return visit to Alpine to see Judy's work and about the great plant surprises I found there! Judi is now working with a welder Named Alan Wharton, whose more refined style works very well with Judy's designs! this Bonsaiesque landscape is very special and is what Judi sees from her living room windows. Revisiting some old friends. Too bad there was a garden and an electric fence between us. I'm sure I could have found a carrot in my car for this sweet looking horse! This purple and red combination throughout the garden is very effective. One of several balls fabricated by Denny King. I also love the stand! Judi calls this a bird but it looks a little angelic to me. Either way, it's pretty groovy! Horse shoes make a perfect stand for this sphere in Judi's garden which is surrounded by her horse pastures. Don't be frightened by this dragon! She may look fearsome but she's really very sweet! See, she has a heart in her hands. Let's assume that she's not just ripped it out of someone else's chest, shall we? This bird made me laugh out loud! Loving everything in sight, next came these new super mega seed pods. I fell hard for these! Here is that fellow who follows Alison and me around to gardens sometimes shown here for scale. These new "seed pods" are about three feet across! A copy of this one will be coming to my jungle! It's unfortunate that the sun wasn't shining when we visited as these simply glow in sunlight. Crazy flowers? Undersea life? something from outer space? They're wonderful as is the evergreen border in which they're displayed. Year round color! Judi, Alan, and Denny's work is fun and unusual. I haven't seen anything quite like these anywhere else so get on over to Alpine Nursery and take one home to your own garden! Tom says he's waving back & feeling fine. Very nice work. Love the windmill by the horse (always keep carrots in your car. You never know when you might run into a little pony). These seed pods are very unique: I could easily see a few of them placed in my garden. That fellow you used for scale appears to be searching for a hammock! Dog treats, carrots, apples, birdseed, bunny food, there's no end to the treats that should be kept in the car, right? I got to know Judy when I made the fused glass pieces for that windmill. That fellow is always looking for a place to nap! Thanks for the update on Judy's art work. They would all be great additions to the garden. I especially loved the spheres which are beautifully displayed. It's a pleasure to share her work! Her artwork can brighten up and add cheer to any garden all year round! Tom looks a little skeptical. It's hard to know what he's thinking since he shaved. Wow! The seed pods are way cool, and the metal work is wonderful! What a garden full of treasures. Interesting artwork! I was surprised with the big size of the one next to Tom (I suppose that's his name). Many of the "seed pods" were that size. So much fun to see! Love those seedpods! Gorgeous, and I bet they really are beautiful when the sun shines through them. They add a lot of color to a winter garden. I just went to the Bloggers Fling website and realized you live in WA instead of OR. D'oh! Awesome art above. :o) Really looking forward to meeting you and Allison! Looking forward to meeting you too! We'll have a grand time! Thanks Pam, that's a fine idea!